Forget Playstations and Interactive whotnots, if you want to really enjoy karaoke the old fashioned way with family and friends, then this is the one for YOU! Twenty stunning tracks covering five decades of classic pop music means there is literally something for EVERYONE! No complicated set up procedures here, oh no, just slot the CD into your player, and sing-a-long!! For Mum weve got Elvis and Abba, for Dad weve got Tina and Kylie, and for the kids, well take your pick from Robbie to Sugababes, Scissor Sisters to the latest sensation High School Musical. Oh and dont forget ol gran she loves The Beatles! 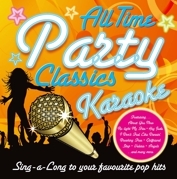 Have a great sing a long this Christmas with ALL TIME PARTY CLASSICS KARAOKE you know it makes sense!